Point-of-sale systems are critical to retail business success. 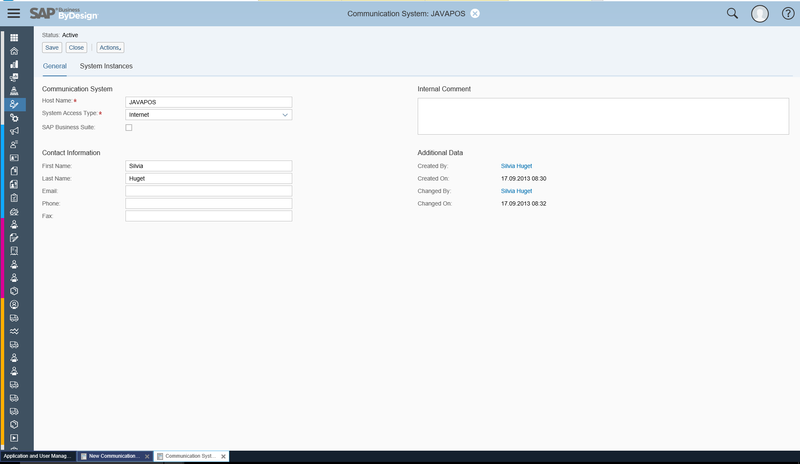 SAP Business ByDesign Point-of-Sale (ByD PoS) interface offers flexibility that empowers users to quickly and easily configure point of sales web service interface and ready to be consumed from any 3rd party application. This blog post provides you with an overview on how to configure PoS interface in ByD and considers some frequently asked questions related to point of sales integration scenarios. 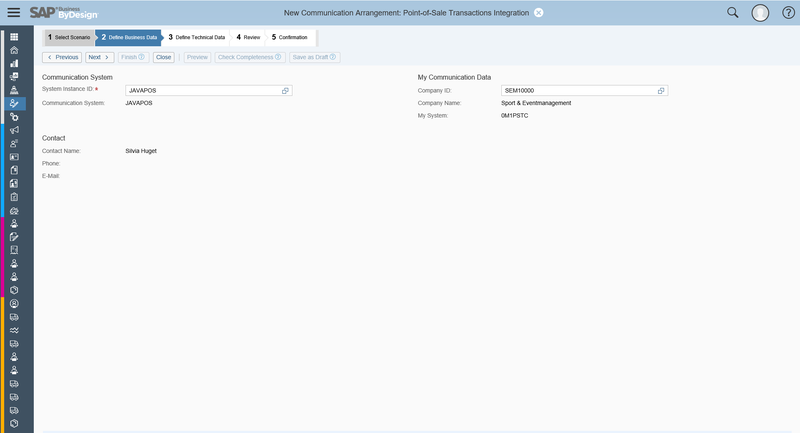 SAP Business ByDesign provides the prepackaged integration scenario “Point-of-Sale Transactions Integration” to connect the PoS system with ByD using web services. 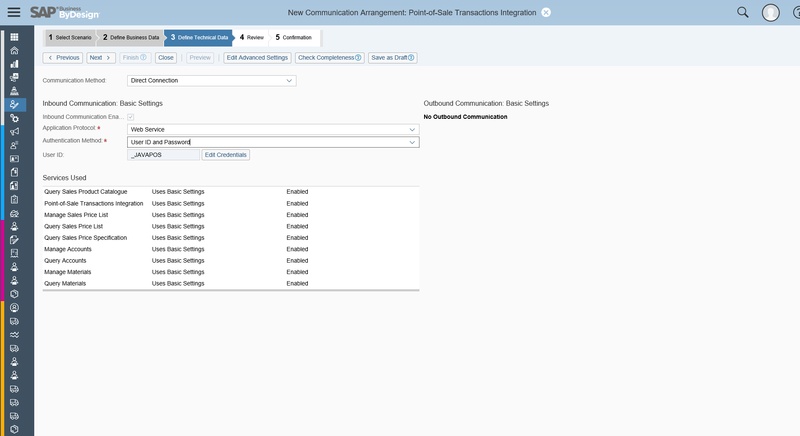 As part of the Point of sales enablement you can configure this prepackage integration scenario and further web service interfaces by following the steps in ByD. 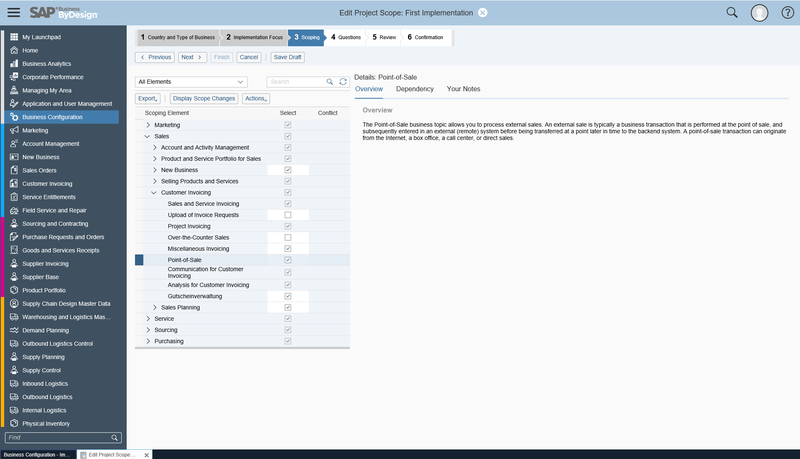 SAP ByDesign offers business features which can be scoped in and then the feature is ready to be consumed out of the box. ByDesign offers E-commerce functionality, which can be used after scoping the functionality in business configuration, its an optional step to consume the PoS interface. In a 3rd party PoS application integration with ByD PoS user will have to synchronize several master data like Customers/Accounts, Products / Articles, Price List, Sales Orders, Service Orders, Service Confirmations and those relevant web service APIs are part of E-commerce functionality, to use those interfaces the feature has to be scoped in ByDesign. Note: alternatively to scoping the pre-packed integration scenario, you can as well create custom integration scenario with additional web services. In ByDesign communication system represents an external system which is used for application integration.Communication systems can be, for example, external time recording or master data systems. For more information, refer to Communication Systems Quick Guide in the embedded ByDesign Help Center. 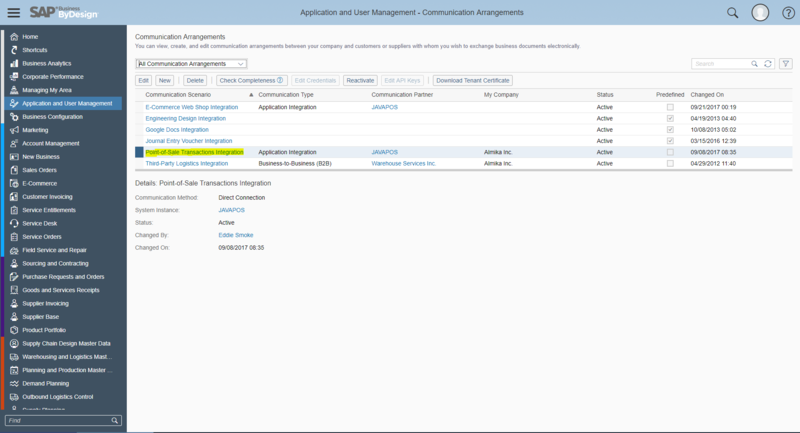 Before you can use a communication system in an application integration scenario, you need to create a communication arrangement. In ByDesign Communication arrangements help you to configure the electronic data exchange between the ByDesign solution and a communication partner. Communication arrangements can be set up for multiple business documents and communication methods.The solution provides communication scenarios for inbound and outbound communication that you can use to create communication arrangements. Inbound communication defines how business documents are received from a communication partner, whereas outbound communication defines how business documents are sent to a communication partner. Business-to-business (B2B) : This communication type defines an electronic data exchange with a business partner. 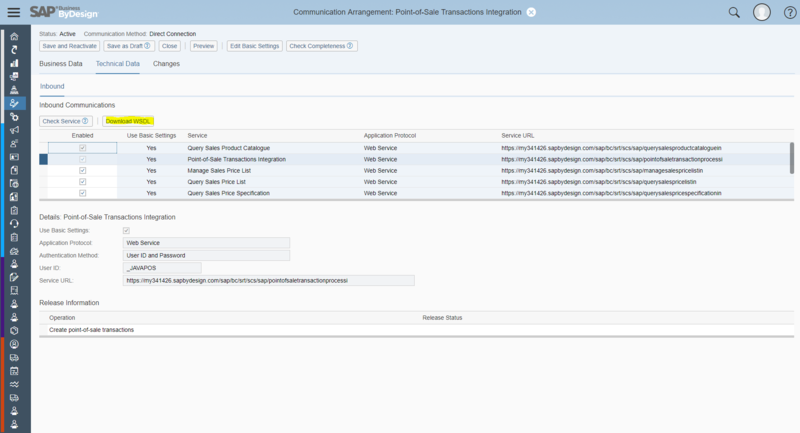 Application integration: This communication type defines an electronic data exchange with a communication system. For more information, refer to Communication Arrangements Quick Guide. The Point-of-Sale integration is Application integration and hence you can create communication arrangement for the communication system which was created in the last step. Select Communication Scenario “Point-of-Sale Transactions Integration” Note : User could use the standard prepacked integration communication scenarios. Edit the Credentials by clicking on “Edit Account”. Remember the credentials, it would be used in the configuration of the 3rd party application which calls ByDesign PoS interface. Configuring E-commerce communication arrangement is a optional step and required only in case of a 3rd party PoS application integration with ByD PoS where user will have to synchronize several master data like Customers/Accounts, Products / Articles, Price List, Sales Orders, Service Orders, Service Confirmations and those relevant web service APIs are part of E-commerce functionality, to use those interfaces the feature has to be scoped in ByDesign. 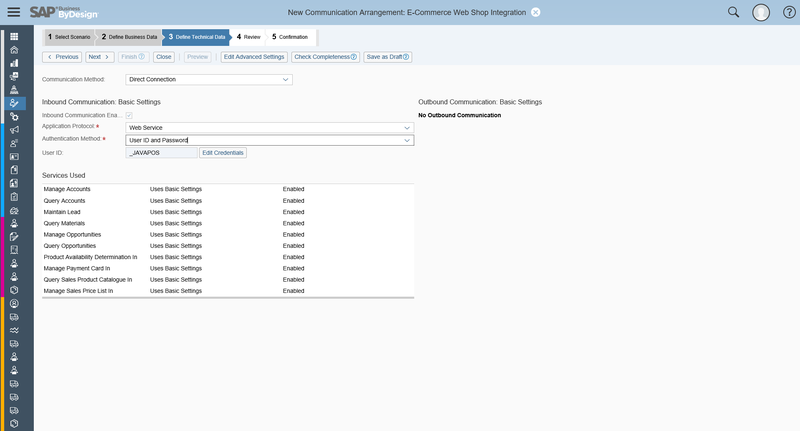 Alternatively to the prepacked integration scenario to the E-Commerce integration you can create custom integration scenario with the web services required. Select Communication Scenario “E-commerce Web Shop Transactions Integration” Note : User could use the standard prepacked integration communication scenarios. Edit the Credentials by clicking on “Edit Account”. Remember the user and password, it would be used in the configuration of the 3rd party application which calls ByDesign PoS interface. 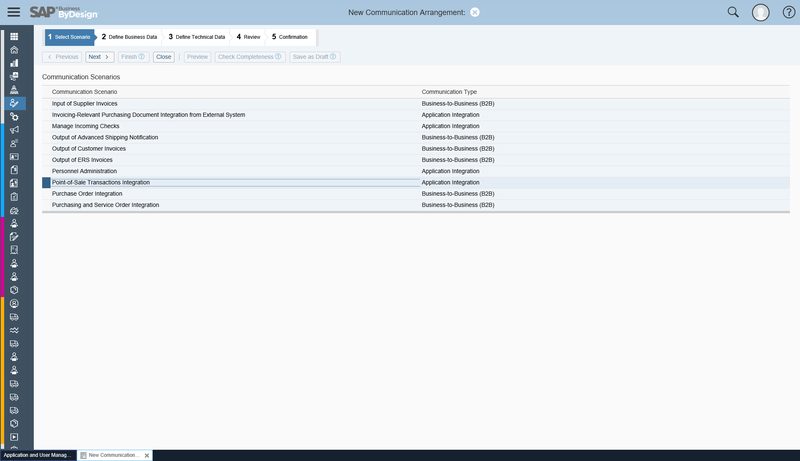 In the the table search for communication scenario “Point-of-Sale Transactions Integration” and in the result list, Select Communication Scenario and click on “Edit”. click on “Technical Data” and then click on “Edit Advance Settings” button . 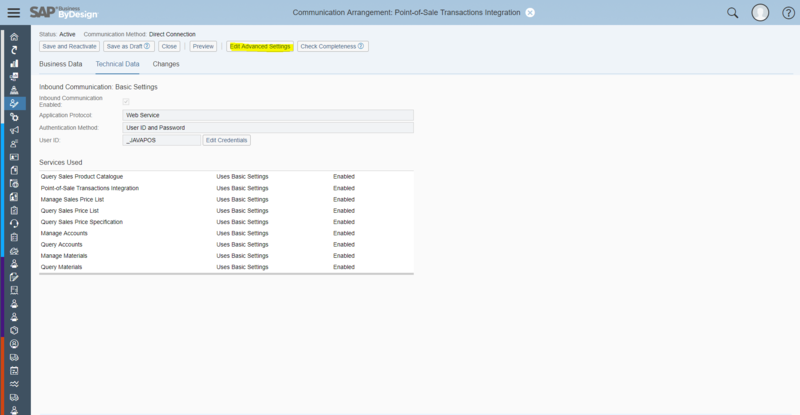 Select the service “Point-of-Sale Transactions Integration” in Inbound communications list. Save the WSDL in local file system. 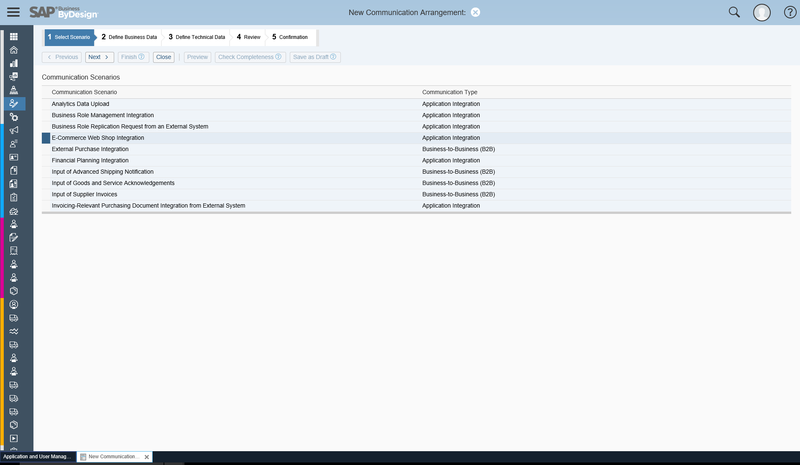 Note: ByDesign PoS web service interface can be testing using WSDL file in any web service testing tool like SOAP UI.